MOTOGRATER has unveiled the cover art and details for their upcoming album, Desolation, whish is scheduled to be released near the end of 2016. Providing the artwork is Sam Shearon, who has created covers for comic books and graphic novels including: Clive Barker's Hellraiser, Judge Dredd, The X-Files, Mars Attacks, KISS, and Clive Barker's Books Of Blood. Shearon also worked on album sleeve artwork and merchandise designs for: Godhead, Ministry, Rob Zombie, Iron Maiden, Powerman 5000, Biohazard, American Head Charge, Rammstein, Fear Factory and Kill Devil Hill. Producing the new album is Ahrue Luster, current guitar player for ILL NINO and former guitar player for MACHINE HEAD. Mixing the album is Joshua Wickman (KING 810, WITHIN THE RUINS). Samples and electronics will be provided by Phil Western (known for his work with SKINNY PUPPY/NINE INCH NAILS) among other collaborators not yet announced. Jon Berrier will also be lending additional engineering/production skills to the project. 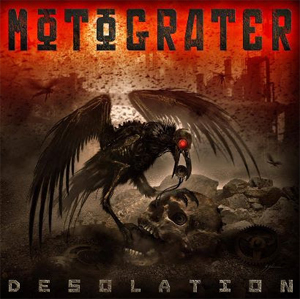 Desolation is MOTOGRATER's first full-length album since the 2003 Elektra/No Name self-titled release featuring Ivan Moody (FIVE FINGER DEATH PUNCH) on vocals. Now fronting the band is James Anthony Legion (DEADFORM, THE BREATHING PROCESS).